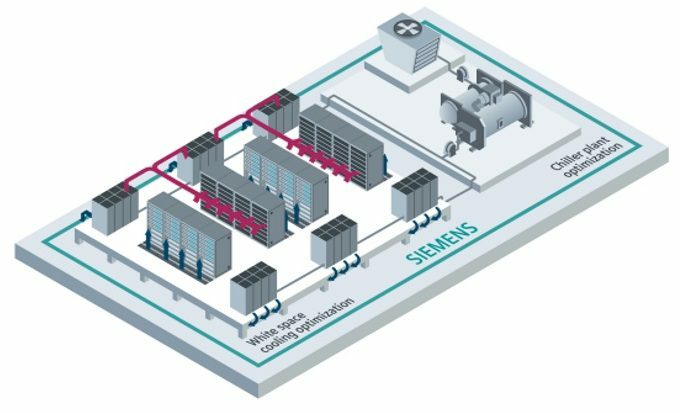 by Brianna Crandall — May 11, 2018 — The Siemens Building Technologies Division of global technology provider Siemens AG is expanding its existing Thermal Optimization offering set for data centers to intelligently ensure both highly efficient cooling production and cooling distribution throughout the entire facility. To improve the way cooling is distributed throughout data center “white space,” Siemens is integrating cooling technology provider Vigilent’s artificial intelligence (AI)-based dynamic cooling management solution into its data center portfolio. Siemens will leverage Vigilent’s real-time data analysis capabilities to dynamically match cooling to information technology (IT) load in server rooms. In addition, Siemens strengthened its strategic partnership with Vigilent by becoming a minority shareholder. Siemens works with data center managers around the world to enhance the performance of their buildings via a wide range of facility improvement measures and services such as Demand Flow for Chiller Plant Optimization. Our partnership with Vigilent represents an important expansion of these capabilities and a prime example of our commitment to digitalization within the building industry. Partnering with Vigilent will expand Siemens’ Thermal Optimization offering set, which is designed to holistically improve data centers including the cooling plant and the white space. For data center operations, this represents a considerable reduction in energy consumption while increasing nominal cooling capacity and ensuring data center reliability, says Siemens. Moving forward, the two companies also plan to jointly develop new solutions and address the data center market globally. Vigilent has pioneered the use of machine learning to optimize thermal environments in data centers. By combining our solutions with Siemens, we can expand our value and reach mission-critical facilities across the globe. For more information about Siemens data center management solutions, visit the company’s website. These online AMCA courses can help you understand the new metric for comparing fan energy efficiency October 15, 2018 In "Products and Services » Webinars, Education and Training"
Switching buildings to electric heating from fossil fuels can create “massive” carbon and cost reductions, finds the Rocky Mountain Institute July 4, 2018 In "Surveys and Trends"